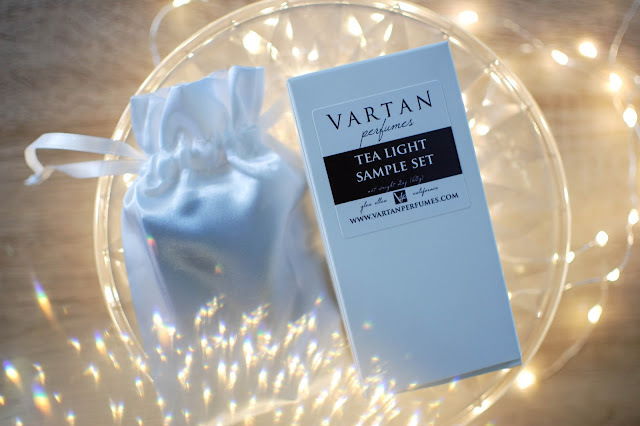 These products were sent free from Vartan Perfumes for reviewing purposes. All opinions my own, as always. Vartan Perfumes is a house I follow on IG. I find myself admiring the styling, scent descriptions and overall aesthetic of the brand. 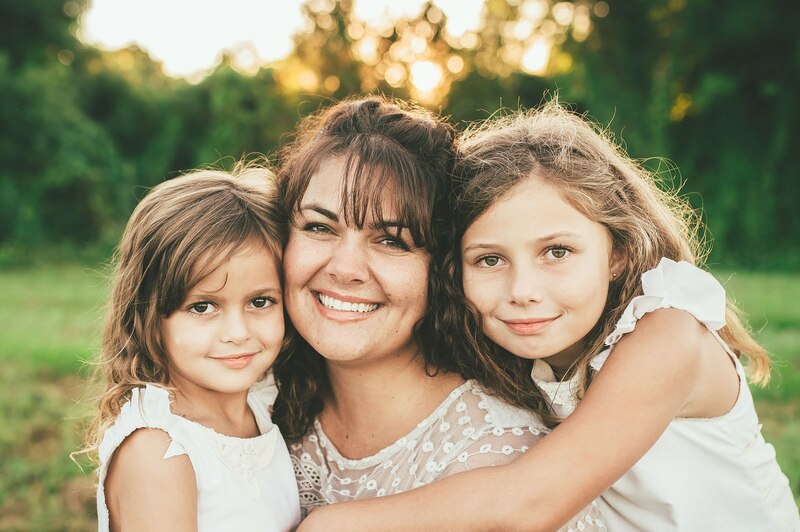 Kristen Vartan, the house perfumer and owner, is a kind and talented woman. We have interacted via IG for a while now and many of her creations have piqued my interest. I look forward to sharing these aromas with you that she so kindly shared with me. All items came packaged beautifully. 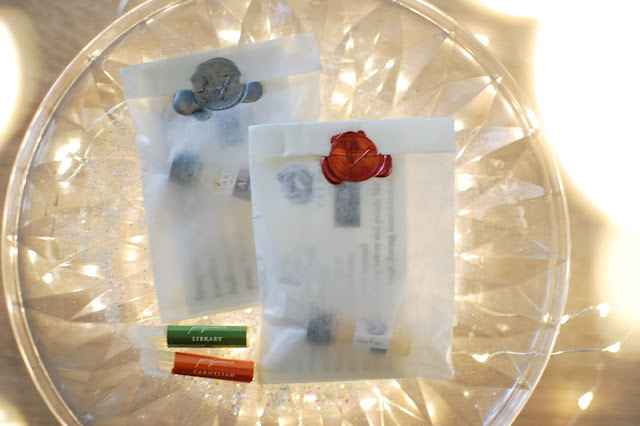 Samples were sent in glassine envelopes and closed with a custom wax seal. Pure elegance. This sample set of four tealights can be purchased for $8 and is a nice way to try the scents before investing in a full sized candle for $22. Spice- Notes: Autumnal leaves, sweet spice bread, mulled cider and the scents of fall. This is a beautifully sweet and dreamy fall scent. It does smell of creamy spice. A touch gourmand with a whisper of apple cider and spiced cakes but there is a vanilla laced amber warmth lurking within as well. It had a nice throw for a tealight. About medium on my nightstand. Easily detectable. Verve- Notes: Ginger, dried lavender, lemongrass and fresh herbs. Verve is a beautifully blended herbal aroma fertile with tender shoots of lavender and kitchen herbs all arrayed in the windowsill. Fresh and clean while being natural and refined. This one appeared to me a touch lighter than Spice and Autumn in throw so not sure how it will perform in the larger candle version but it was nice and airy. Amulet- Notes: Warm amber, black pepper and smoky peat. Sweet and viscous amber oozes with decadent notes like candied suede and vanilla tobacco. I love this scent. It threw about medium-strong in the bedroom and smelled lovely. Autumn- Notes: Ripe black currants, clove, toasty French oak, and hints of vanilla. This is one stunning scent if you like woods. The oak shimmers with gilded leaves and sun-drenched warmth. There is a vein of vanilla woods and amber light weaved among the oaken boughs. It gave a nice throw that scented my bedroom in a mist of autumnal woods. 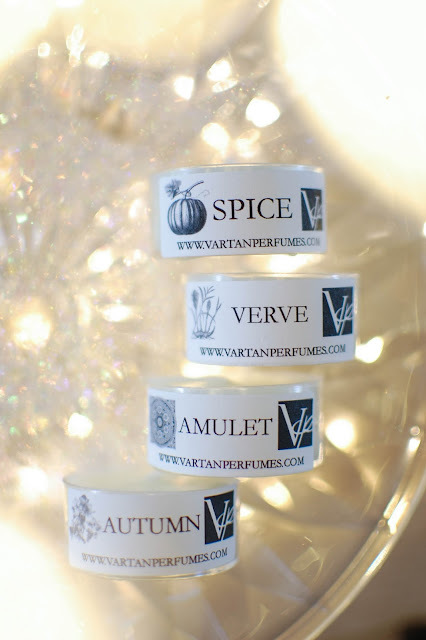 Out of the four tealights I sampled I could see myself purchasing Amulet for year 'round burning and Spice and Autumn... well... probably all year too! I really enjoyed those three in both scent and throw. A set of all three, Garden Dewdrop, Library and Carnelian, can be purchased as small samples for $6. These are in EDP formulas. Library- Notes: Bergamot, aged leather, fig leaf, barrel aged whiskey, cigar box tobacco, sandalwood and musk. Top notes sparkle with bergamot and creamy green fig leaves like so much sunshine filtering through lobed leaves, a silhouette reflecting in the Library's windows. Then quickly a studious heart of wooden shelves and vellum pages unfolds as the Library opens up. The foundation of Library smells of white musk motes and again, creamy returns to book end both the beginning and end but this time in the form of creamy sandalwood. Garden Dewdrop- Notes: Cucumber, ginger spice, violets, lily blossoms, iris and sandalwood. Powdery violets and papery lilies embellished with crystal dew drops bracket the entrance to the garden. Strolling further into its tender heart, the earthy yet refined musk of iris greets the nose, their purple corollas nodding in salutation. The backbone of the deep garden is a thin copse of woodland that still has some iris scattered about the tree line. I love the smooth earthy floral tones of this perfume but I do love my violets and iris. Carnelian- Notes: Cinnamon, black pepper, blonde tobacco, vetiver, spicy carnation, amber, vanilla and tonka bean. Carnelian cuts into the top notes with fiery spice and pepper. Shades of orange and red vibrate and shine. The carnation and golden tobacco heart gleam like a cabochon, polished and glass smooth yet warm. The drydown mellows into a powdery vanilla amber haze. The next two perfumes are in perfume oil format and 0.5ml samples can be purchased for $8.00 each. Air- Notes: Citrus, spice, lotus flower, dried fruit, French oak and sandalwood. Aged bergamot and just on the edge of overripe oranges drift along the skin. The glassine edges of lotus petals emerge piece by aquatic piece, smelling of bulb flowers like lilies and hyacinth and paperwhites. This is the air over a still water pond brimming with lily pads and blossoms. The drydown pulls the woods forward, closer to the pond's edge. Rose Ritual- Notes: Earthy soil, creamy vanilla, plush red roses, soft woods, spice, toasted caramel. Spicy roses grow leggy and wild under an arbor of oak trees. The tannic oak leaves litter the ground with their softly acidic earthiness and nourish the roses. Untamed and unapologetic roses, abundant and willful. A true rose scent for rose lovers. 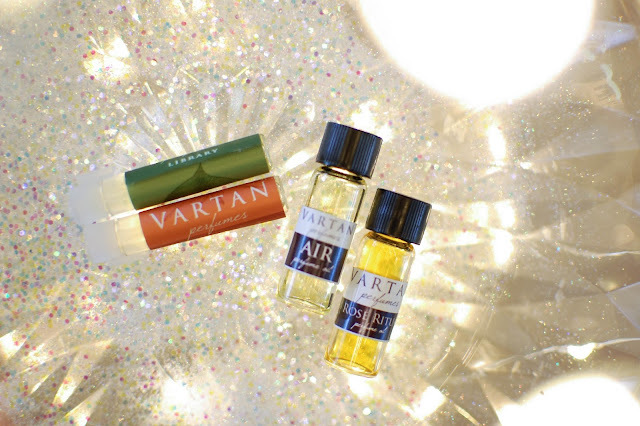 I enjoyed sniffing around the Vartan collection of fragrances. I plan on revisiting Library and Garden Dewdrop and squeezing in a full sized candle in either Amulet, Spice or Autumn. It will be hard to narrow it down. Do you enjoy lighting tealights? What is the last perfume you sampled? Not quite the point of this post, I think, but I love the photography setup you have going here with the iridescent glitter and the glass tray (?) I'm always seeking better ways of adding some sparkle to my photos - they feel very flat. Anyhow, these look super - love those little wax seals. Thank you! I was using some photography props like twinkle lights and cut glass to get the reflected light effects. It was fun! Your photos are beautiful. I love the homey cake trays, wreaths and beautiful props you use. It feels comforting and appealing to the eye. I am a wax seal geek too. I always kinda want to use some but never got around to learning or buying the stuff. I am not sure what I would use as my seal? Too many likes and fandoms.